I haven't posted a game here in awhile, because most of my recent Happy Meals have been underwhelming. This one (a Raseiniai in my Churchill I) was fun, though. The KV-1 was the last one alive, and when he appeared broadside to my left while I was hull-down, I thought "I can win this!" - I hit him three times (he did manage to hit me once) and got the raisin! I am regretting not having video enabled on my device now. I am worried that it will make the game unplayable, as my device is really old. Bummer. Edited by TonnerreCadien, 06 July 2018 - 12:03 PM. 1 vs 3 for a kolobanov. 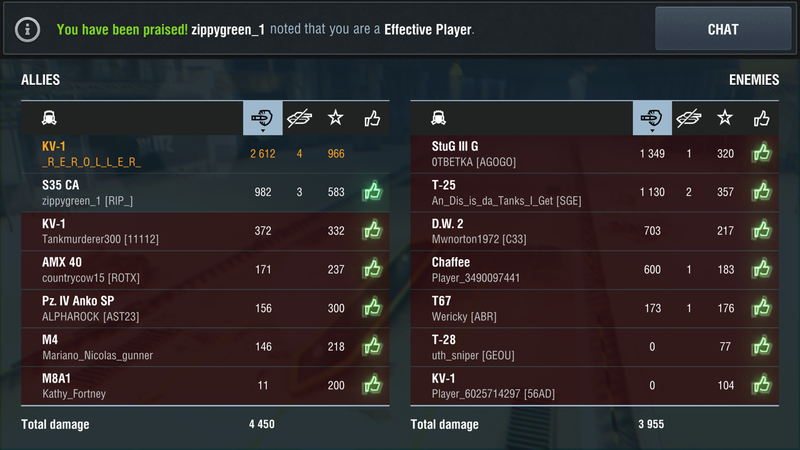 The kv-1s had full health. The Jackson had full health. And the angry connor with 320 health drowned himself. I never took a shot. And the m4 old g ... called me a cheater. Nice work on the Ras Tonnerre. Maybe try turning on replays but setting it to only keep a few. I favorite and save (email to myself) any that I want to keep pretty quickly, so I'd probably be fine with setting it to only keep 5 or so. Ace in my 12 t. Not the best game, but I was happy to get the ace. Not an Ace, nor even a mastery 1, but I was pretty pleased with this Radley-Walter's as I was low tier. 2 players called right so I went right.. as soon as the first red was spotted they must've peeled off but I continued my flank and then as I had an unrestricted view of the reds from my position i proceeded to lay waste to the red team and helped to get the win despite my team being down by 3 tanks. Edited by ZebraUp, 06 July 2018 - 07:07 PM. Edited by Herbie_N124, 07 July 2018 - 04:16 PM. Went middle at Black Goldville. Edited by Herbie_N124, 07 July 2018 - 04:22 PM. Edited by Herbie_N124, 07 July 2018 - 04:02 PM. Edited by Herbie_N124, 07 July 2018 - 04:15 PM. First Ace in my Jumbo.. along with a Radley-Walter's.. made even sweeter by the post battle chat from a unicum telling me I was "lucy" (i think he meant lucky?) and then telling me I was trash, etc. despite also getting a Kolobanov's vs him and and a few others. Made me smile. Edited by ZebraUp, 08 July 2018 - 12:50 AM. Edited by ContinuityGamer, 08 July 2018 - 04:46 AM. 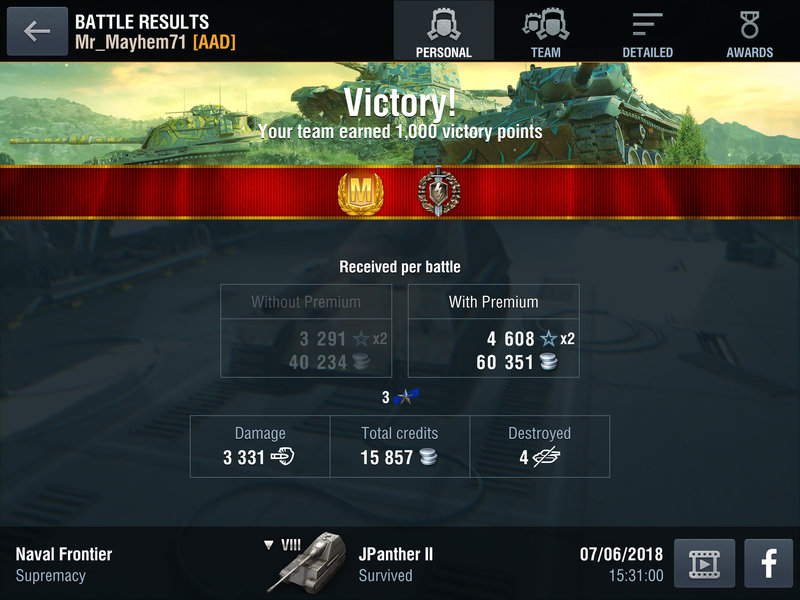 3238 damage and 7 kills with my Dicker max lol. Ended the game me vs 5. If I can Ace it, anyone can. My Cromwell B Ace was a tier 6 Supremacy battle on Oasis Palms. 3151 damage, 3 kills, capped 2 bases I think, and High Caliber Award. Edited by MarBearCat, 08 July 2018 - 07:35 PM. that one wasn't that great a game for me, I was referencing the four red 0's, lol. I got something to set my sights on now though, thx. Put it this way. I have 409 battles in the Bromwell with a 66% win rate and have aced it exactly once. I had 1150 base XP in that one.